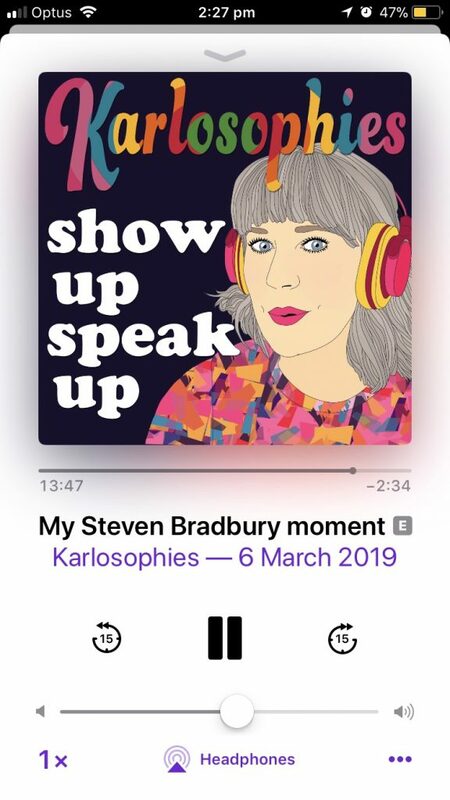 I was listening to this episode of Karlosophies on my lunch break at work recently and it made my brain start swirling. Aka thinking. In a good way. Karly always makes me think. Sometimes it’s in a good and clearly intended way. In this episode she talks about surrendering rather than fighting in frustrating situations. Waiting for things to unfold. I always feel like I have to fight things. So when Karly talks about surrendering it’s also interesting to feel my own feelings (basically, rejecting what she was saying without considering it) when she talked about surrendering. Other times it’s about things that I doubt would cross ANYONE’S mind as something that would help anyone. At the end, Karly was talking about her coaching spots opening up. She made an offhand comment that part of the support is via messenger. It made me feel validated. You see, I’ve been mentally trying to work out what to do with Embrace Shiny. I can’t take coaching clients right now until some medical dramas are fixed, but hope to be able to in around a month. I do my coaching via a chat app – Slack. The theory is that a chat app allows for easy self management of all the things. To scroll and see what we’ve talked about. A nice, self contained place. But I was also thinking about a conversation in a business group recently about making things easy for clients (and yourself too). The app felt like a good idea, but is it any more useful than email? At least people are familiar with email. I’m not adding to their learning curve. I’m not delaying them getting into the reasons that we’re working together. I also had (have?) a fear that offering coaching without “calls” will be seen as “lesser”. I chose a non-calls set up for coaching because I don’t have guaranteed times when I can do things such as take a call uninterrupted. So I need my business to work with me, which means it has to offer me flexibility. Which is how I settled on chat based coaching. I know that people say your business isn’t the same as you. But when it’s something fairly personal like this, I disagree with that notion. It really is personal. And how/what/why you are will come across in what you do when it’s one on one. Which brings me (in a very roundabout way) back to Karly. I often don’t resonate with things she says. She’s way more woo woo than me. But I’ve also always, 100% of the time, seen her as someone who wants what suits YOU. Which still feels like a rarity in this online space. I need to go with what I can do my best at. Doing my best wouldn’t be servicing clients with calls. I need to ignore the thoughts in my mind about being “lesser”. About me not being my customer. And just go ahead with what I need to do. And I think that’s applicable no matter what it is. Business. Life. Study. Whatever. There are a million theories and shoulds and expectations but at the end of the day, you have to do what suits you. You sure got me thinking with this too. I thought I had a market to help those with kids starting school. Turns out the internet could do that well without my help. I did the same to help graduate teachers get through their interviews and secure employment. Turned out well. But I could not take anyone’s money for it. I am so NOT a business person. I like(d) being employed and permanent. Good wishes to you in your ventures when you are ready! Next week’s optional prompt for #lifethisweek is 11/51 It’s MY Favourite. Denyse.